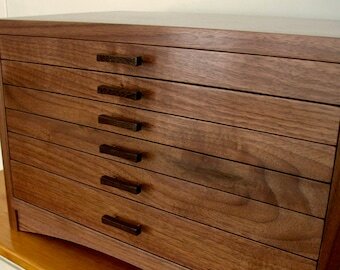 Curly cherry case, curly maple drawers, rosewood accents. 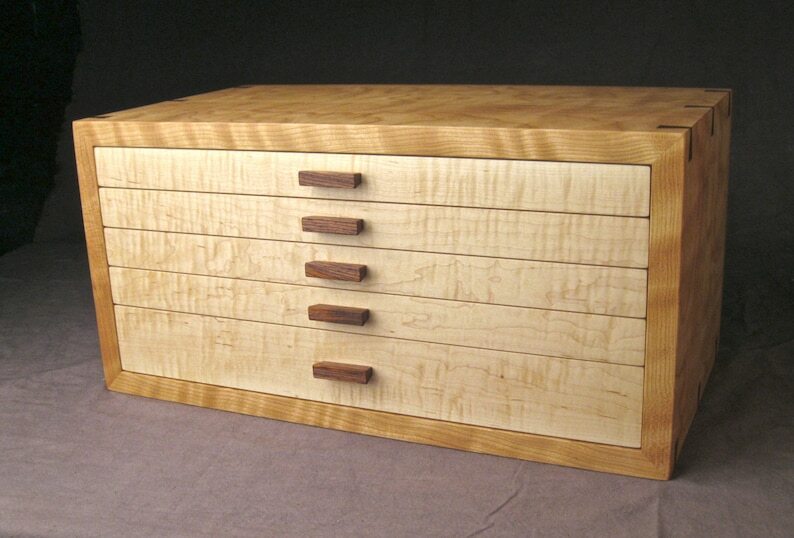 Solid hardwood, handmade jewelry chest. 4 drawers 1.3/8" exterior ht. 1 drawer 2.5" exterior ht. Drawers 1 & 2 have 32-2"x2" spaces, drawers 3 & 4 have 8-3"x4" spaces. Drawer 5 is undivided. Dividers are removable and adjustable. A proven design, satisfaction guaranteed. 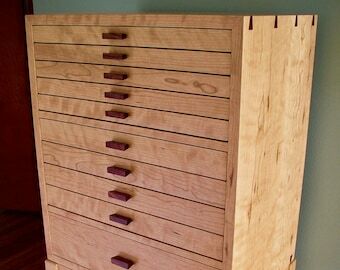 This is a jewelry chest that your great grandchildren will be using. The quality and craftmanship are top notch. I absolutely love this box, it is one to treasure. It was very carefully packed and shipped promptly. Highly recommend this artist and his creations. Wow, what a fantastic Jewelry box! The craftsmanship is more impressive in person than the pics convey. My wife just loves it! All of my questions were addressed promptly, the purchasing process was seamless, the box arrived very well packaged and in perfect condition. This box is truly a masterpiece that will be used daily and cherished for a lifetime.